The Volkswagen Golf has been a worldwide automotive staple for decades and certainly Volkswagen’s bread and butter for equally as long. But the little hatchback that could (badged as a Rabbit here for the last few years) hasn’t felt the same sort of love from the U.S. However, the sixth-generation Golf builds on the first-rate design and excellent drive quality from before and takes a better step forward, ensuring a healthy amount of newly interested parties. With a subtle exterior redesign, the newest Golf continues to be one of the most stylish and practical small cars on the market. Taking queues from the European-only Scirocco, the rounded-off headlights, grille and overall softer appearance are replaced with a more angular front-end that makes for a more aggressive stance. Slight noticeable improvements add to an already high cabin quality. In either three- or five-door guise, the hatchback provides versatility and style, but the most significant addition for 2010 comes under the hood with a thrifty 2.0-liter, four-cylinder turbocharged diesel engine. 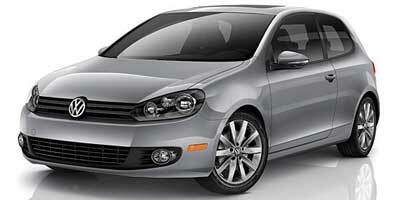 If the success of the Jetta TDI is any indication, this new Golf is poised to outshine its predecessors. The addition of a TDI to the lineup is reason enough to buy the new Golf, combine that with the option of mating the TDI to either a six-speed or DSG and you have gold. We like the build quality and the utilitarian, yet stylish interior. The close to $1,100 dollar price difference between the manual and DSG is somewhat steep, as is the $1,750 navigation system. The five-cylinder isn’t overly peppy, and performance pales in comparison to the more robust diesel. The 2010 Golf, while not a sports car by any means – we’ll save that for the GTI – is a well-built and solid addition to the small car world. At highway speeds, there is little to no wind noise and the Golf feels planted, even at Autobahn speeds. We like the power and torque from the TDI – and the good gas mileage too. Both the three-door and five-door models handle and drive better than they need to for this market. VW overshooting their audience is your gain. 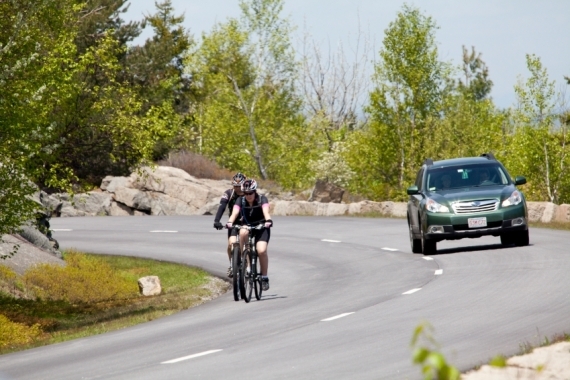 The biggest changes for 2010 are in the engine and drivetrain options. With the addition of a previously European-only 2.0L TDI (found currently in the Jetta), VW’s ultra efficient diesel engine makes its debut with either a six-speed manual or VW’s clever DSG gearbox, another first for U.S.-bound Golfs. The 2.5-liter five-cylinder engine is a holdover from the previous MKV and puts out 170 horsepower and 177 lb-ft of torque. Power is delivered through the front wheels via either an automatic or five-speed manual. The real engine choice is the 2.0-liter, four-cylinder TDI diesel engine; while the 140 horsepower may not seem like a lot, its 236 lb-ft of torque sure is. 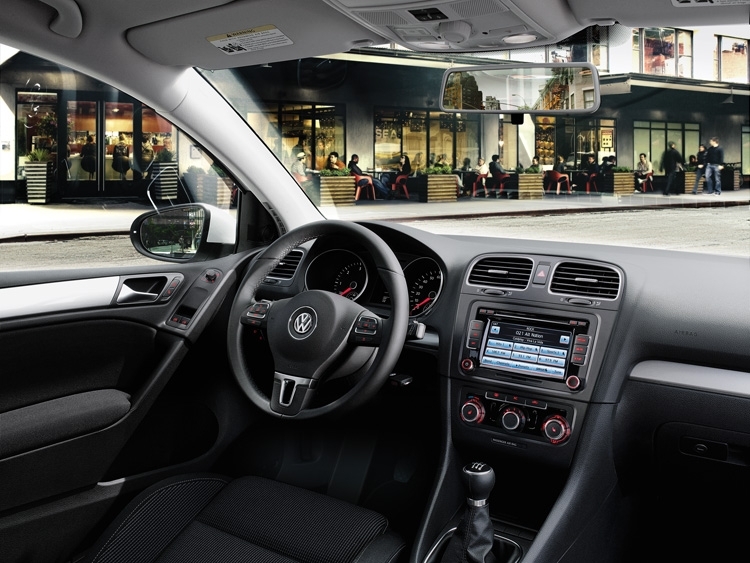 The base Golf comes with a strong list of standard features, like an MP3 CD player with an auxiliary jack for your iPod, as well as cruise control and a tilting/telescoping steering wheel. There really aren’t too many options to confuse the consumer - a sunroof, a cold-weather package and a navigation unit are the standouts. 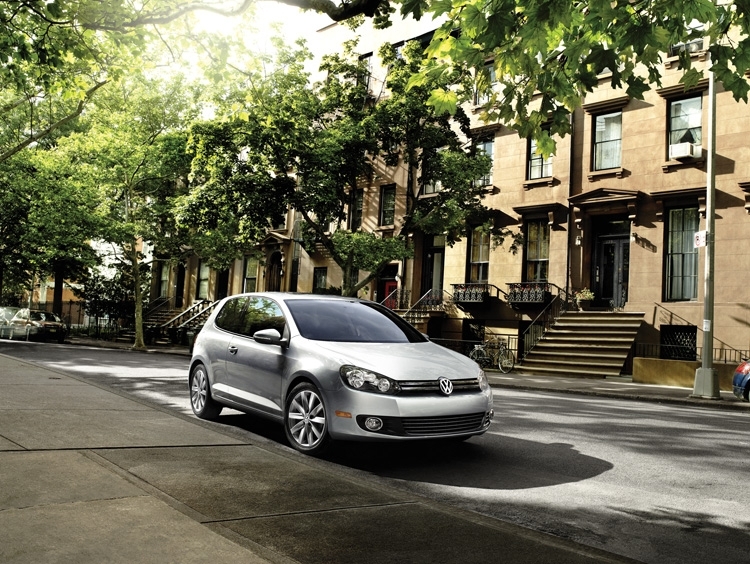 Though the base Golf comes well equipped for the price, the real magic can be found for a few grand more. 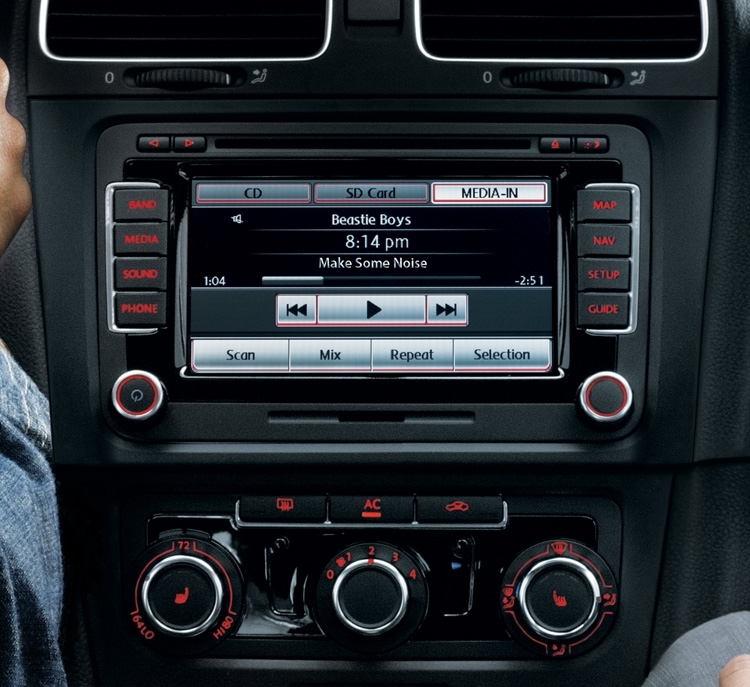 The TDI is awash in technology with a six-disc touch-screen stereo, Sirius satellite radio, and Bluetooth hands-free calling, all standard. Options include a navigation system, 300-watt stereo and six-speed dual-clutch DSG transmission - all are good buys. Like the previous Golf, the new generation continues to be one of the most economical cars on the market. The 2.5-liter five-cylinder returns an EPA estimated 22 mpg city and 30 highway while the TDI diesel arrives at a massive 30 mpg city and 44 highway, enough to leave any hybrid owner scratching their head and wishing for more torque. While the interior layout remains largely unchanged from the previous model, the fit and finish receives a much-needed upgrade. High quality plastics and aluminum accents make for a welcoming cockpit. 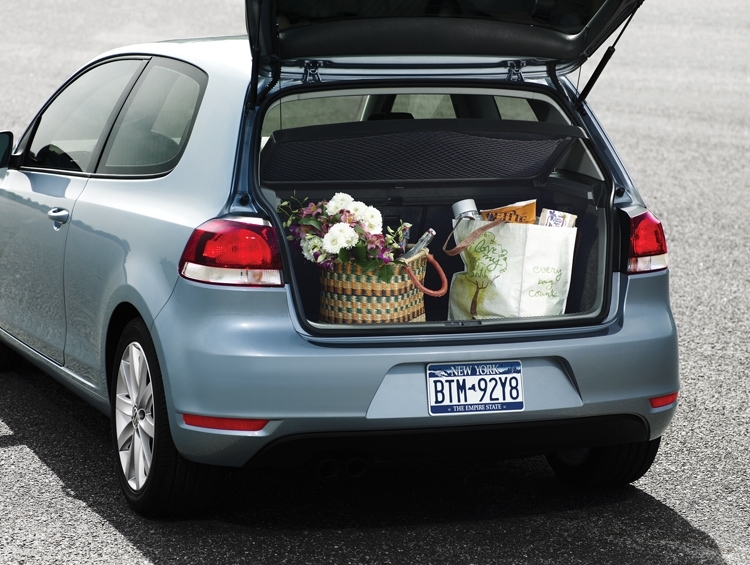 The 60/40 split rear seats make the hatchback a versatile family vehicle. The redesign gives the Golf sharper, more defined lines front to rear. While still retaining the classic Golf look, the result is a more aggressive body. The new grille also extends the company-wide Volkswagen look; not unlike its sibling Audi, VW wanted a continuum to the range. Exterior dimensions remain the same with the exception of width, which has grown by an inch. There are two Golf models, the three-door, 2.5-liter five-cylinder, which starts at $17,490 and extends to $21,990 for the base TDI model, and a five-door, which runs from $19,190 to $22,590. This puts the Golf in the same range as other practical, small cars, most notably the $19,500 Mini Cooper, the $20,290 Mazda 3 five-door and even Honda’s Insight hybrid at $19,800. Despite the competition, the new Golf is likely to inspire as the original practical hatchback. 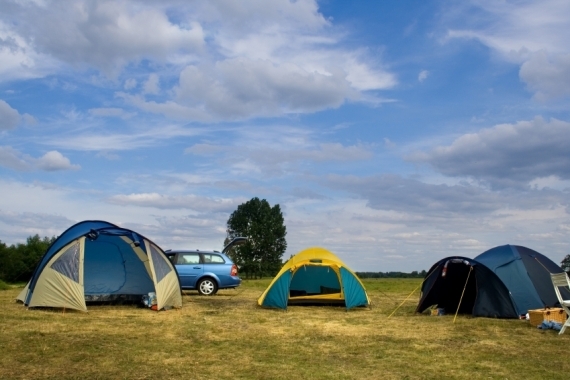 While we like the gas-powered, five-cylinder Golf, we tend to lean towards the TDI. At $22,590 for the five-door, you have a whole lot of pluses: good looks, the functionality of a hatchback, the two rear doors, amazingly great gas mileage and a load of low-end power that’s generally missing from the hybrids on the market today. The Golf TDI is one of the best cars of 2009 and should be on any list if you are in the market for a fuel-efficient and fun-to-drive car.